Android’s open-source nature brings various perks for users. However, it also makes the platform prone to security issues. Malicious app makers and hackers use Android’s flexibility to steal user’s personal info like password, bank details etc. With people relying on their smartphones to store personal as well as sensitive data, this can be a major issue. Other than that, there’s also the issue of a lost or stolen phone. Your phone in the wrong hands might land you in some serious trouble. Well, as they say, precaution is always better than cure, so if you haven’t yet secured your Android device, you should now! 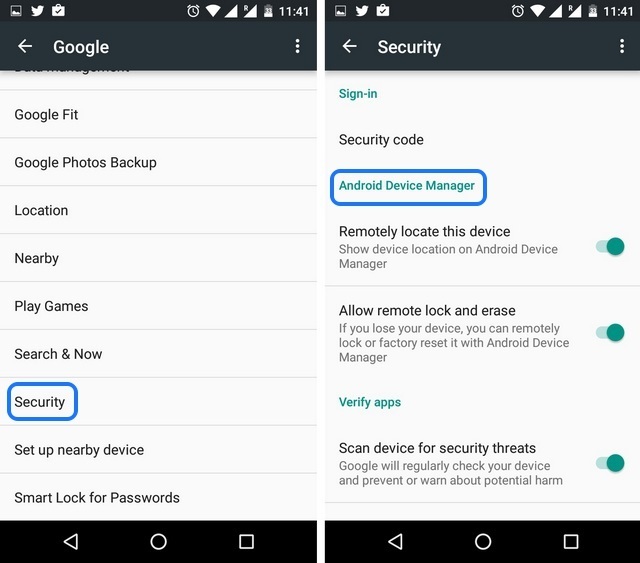 Google has taken some steps to make sure that your Android device remains secure and one of those steps include ability to encrypt your device. 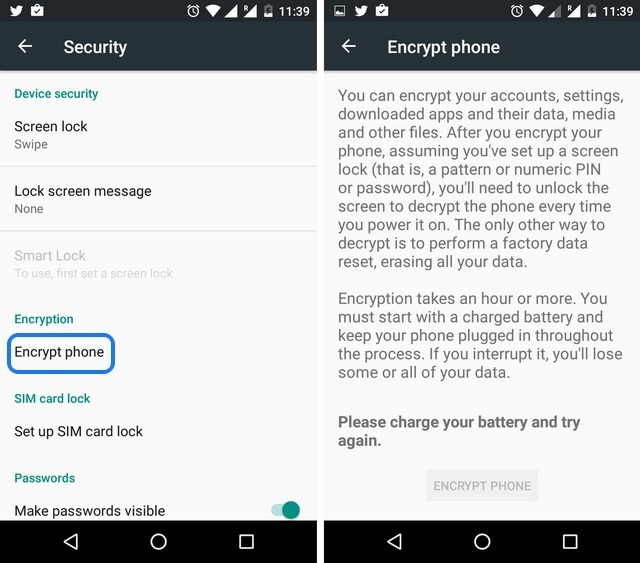 There’s an “Encrypt phone” option on Android smartphones that can be found in Settings->Security. The feature encrypts your accounts, settings, downloaded apps, app data, media and other files. After you have encrypted your device, you will have to enter the PIN, password to access the files. You should encrypt your device if you store sensitive data on your phone, so that even if your device is hacked or stolen, your data will not be accessed until the encryption key is entered. Once you have encrypted your device, you can only decrypt it by doing a factory reset. Also, the encryption process requires you to plug in the charger throughout the process and it takes an hour or more. Don’t interrupt the process though, as Google says you might lose all or some of your data. Android 6.0 Marshmallow includes iOS-like app permissions, which makes sure you can keep a check on what info a particular app might be taking. Unlike previous versions of Android, apps on Marshmallow ask for your permission when they need it and you have the ability to deny an app a particular permission. 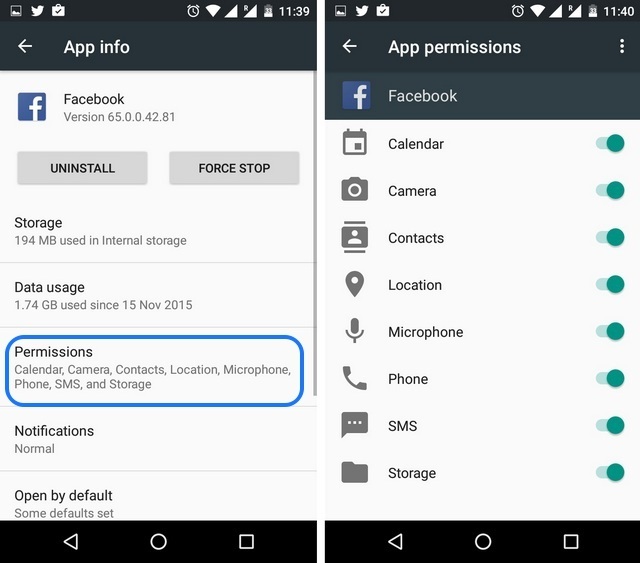 You even have the ability to manage every app’s permission by going to Settings->Apps. There, you can select an app and then tap on Permissions to disable a permission they have. With this nifty feature, you can make sure that an app isn’t taking any info you are unwilling to give. 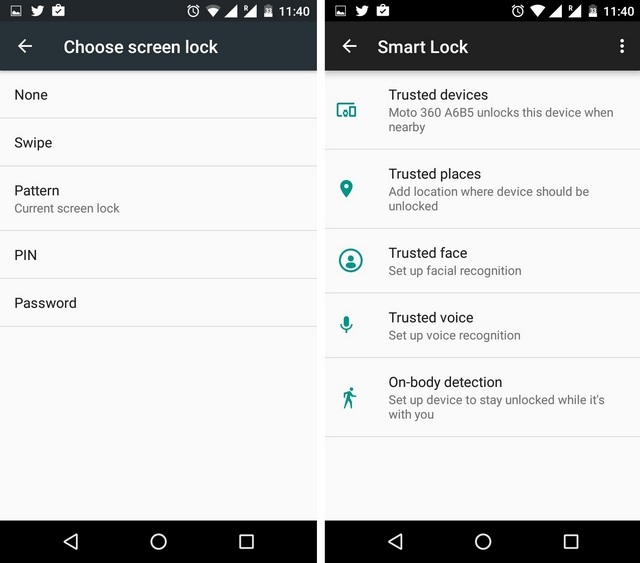 Android includes a number of locking features to make sure that your data remains secured no matter what. You can set a screen lock by going to Settings->Security->Screen lock and choosing among Pattern, PIN or Password. 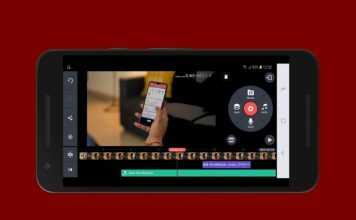 The OS also includes a cool “Smart Lock” feature, which automatically unlocks the device when your trusted devices, locations, faces and voices are in close proximity. Smart Lock is only available when you have set up a screen lock. Android Device Manager is a very useful app, which comes pre-installed on many devices and you simply need to enable it. It lets you remotely ring your phone, erase data or lock it. 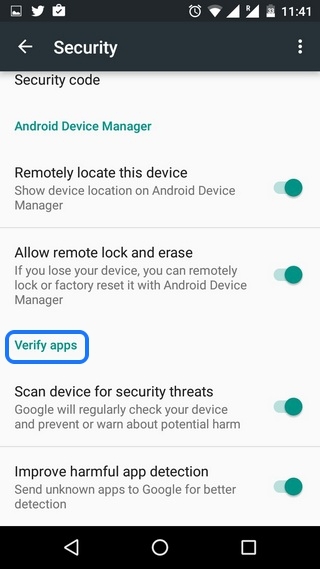 You can enable it by going to Google Settings (Android 5.0 or previous) or Settings->Google (Android 6.0 Marshmallow), then go to Security and turn on “Remotely locate this device” and “Allow remote lock and erase”. 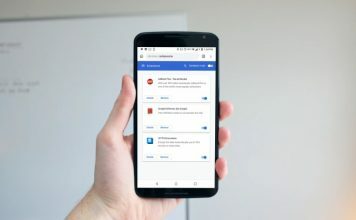 Once you have enabled it, you can sign in to your Google account on another device over at android.com/devicemanager and take control of the remote actions like erase, lock and find your phone in case your device is stolen or lost. There’s a reason that Nexus devices and iPhones don’t come with expandable storage. An external storage not only hampers the performance, it also involves risks of losing your important data. The problem lies in external memory using a mix of EXT and FAT file system, which is considered to be pretty easy to get access to. Plus, when you connect your device to a PC, the applications on the PC have block-level access to files on a sd card, thus having the ability to plant viruses or any other code. We do not recommend storing your sensitive and important info on your device but if you must, you should do it on your device’s internal storage. 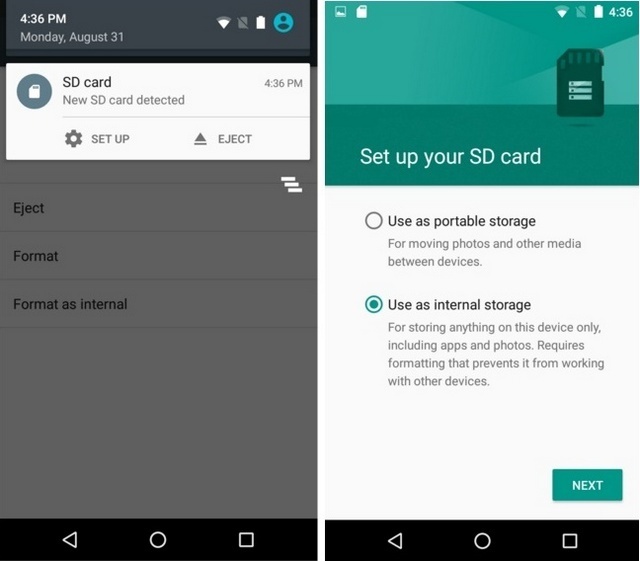 Also, Android 6.0 Marshmallow includes the ability to add an external sd card as “Adoptable storage“, which encrypts the storage and adds it to the internal storage, making it way more secure and fast. If your network isn’t secure, it can be the gateway for hackers to steal your data, so it’s important that you browse the web securely. For that, you can use a VPN app on Android. 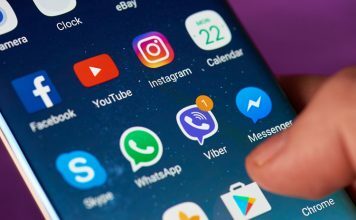 There are some great VPN apps available on Android and these apps make sure that all the information you send across the web is encrypted and your identity remains hidden. A VPN app is your best bet if you want to conduct important transactions on the web without having to worry about your data. Who doesn’t love free internet? A public WiFi network is certainly inviting but it comes with its own set of security issues. Firstly, an open public network allows for snooping, which means that anyone with little knowledge can get to know the websites you have visited on the network. Also, there might be other compromised devices that are connected to the network, which might result in malicious code being transferred to your device. The whole network might even be a faux by hackers to get into your devices, so be very careful! The best way of protecting yourself is using a VPN app, like we mentioned above. So, if you surf on a public network daily, you should consider buying a good VPN app. 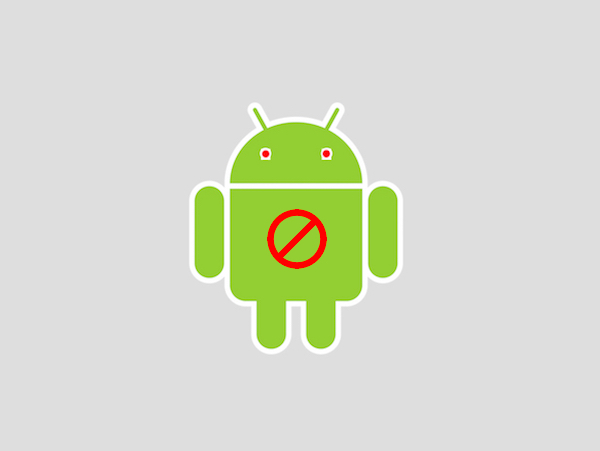 Android users have the ability to sideload apps, which comes in pretty handy at times but it’s not very safe. Some of the apps that are not available to download on the Google Play Store are potentially harmful and that’s the reason Google has blocked them. If you don’t want to take any chances on your security, you should only install apps from the Play Store, as apps available on the Store go through a rigorous process of testing, after which they are published to the Store. But if you still want to install apps from a third party or unknown source, you should turn on “Verify apps” in Settings->Google->Security or Google Settings->Security, depending on the Android version. This results in Google regularly checking if any of the apps installed are potentially harmful. If you want to make sure that your Android device is safe against the latest malicious codes, you should keep your device up to date. 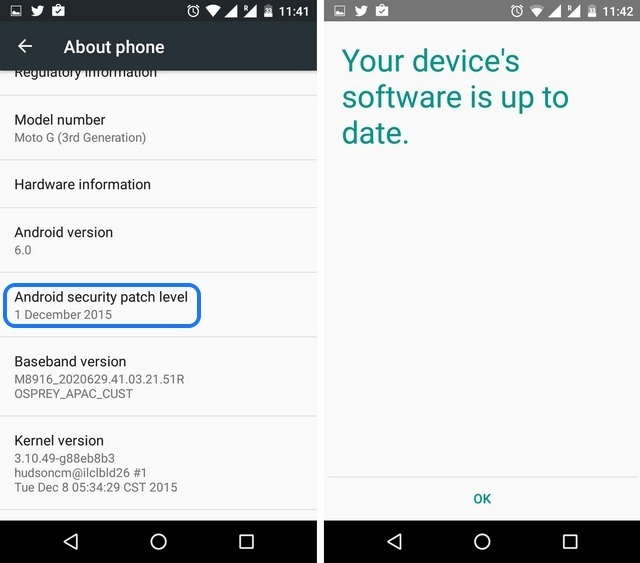 Google along with smartphone manufacturers regularly release minor updates for devices, which bring in the latest security patches. While these updates don’t seem very important, they indeed are! If you don’t want to lose all your data and settings when your Android device is stolen or lost, you should consider backing up your device. 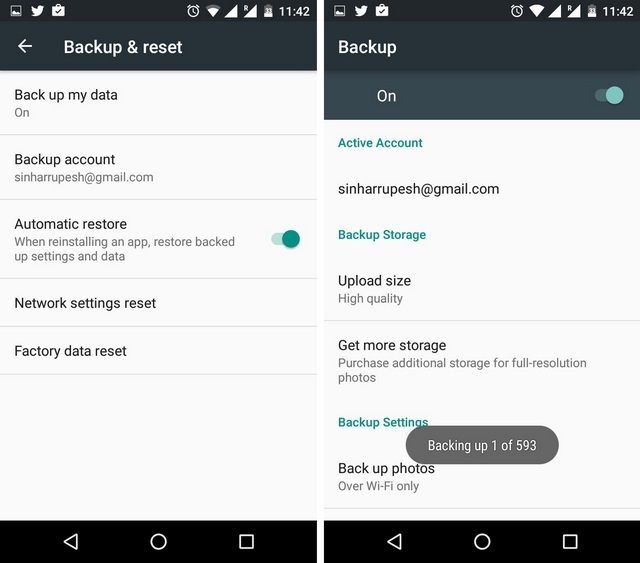 To backup your device’s settings and app data, go to Settings->Backup & reset and turn on “Back up my data”. You can even back up your photos and videos to Google Drive by going to Google Photos app settings and turning on “Backup & sync”. For music, Google Play Music backups all your tracks to the web player, so you can go ahead restore it easily, although Google Play Music is not available in all the countries. Well, in that case, you will have to use one of the backup apps for Android. 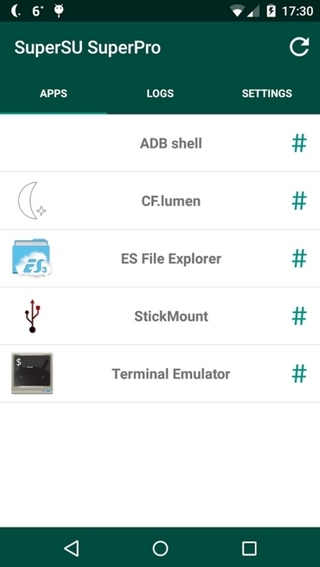 Rooting your Android device brings a lot of advantages (automation, custom ROMs, custom kernels etc.) but it also comes with its fair share of flaws. Rooting makes sure that your device’s security is open to be compromised, as there won’t be any official updates and apps can go ahead and take elevated permissions. This might result in data theft and apps installing malicious code. While we certainly don’t recommend rooting your device if you want to stay secure but if you must, you should install a root management app like SuperSU, which lets you grant or block root access to apps, thus giving you more control. Secure your Android device with these tips! Online security is of paramount importance these days and Android has been criticised a lot over the years for not taking security issues seriously. However, things have improved quite a lot and these tips make sure that your Android device stays secure.